Dr. John Morris is an evangelist preaching the Gospel (Good News) of Jesus Christ. Ordained as a minister in 2002, he has bachelor’s degrees in pastoral ministry and philosophy as well as a juris doctorate in law and is the author of the bestselling book, Resurrected! 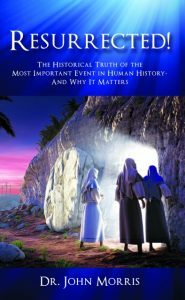 : The Historical Truth of the Most Important Event in Human History—And Why It Matters. In his twenty-five years of ministry, Dr. Morris has served as an evangelist, worship pastor, spiritual director, Christian counselor, instructor of religious education, and deacon. In addition, he has spoken at statewide and national Christian conferences, given retreats on discipleship, spirituality, and evangelism, and been a guest presenter to both adults and youth groups at various churches.